We’d love your help. Let us know what’s wrong with this preview of Make Bright the Arrows by S.A. Huchton. "Soldiers need wars, doctors need patients, and the Nanshe needs trouble. That's just kinda how it is." The galaxy ain't a friendly place, but it's a good sight better when you've got friends at your back. And when the crew of the Nanshe stumbles into larger-than-your-average trouble, they'll need all the help they can get. What starts off as a simple retrieval of stolen g "Soldiers need wars, doctors need patients, and the Nanshe needs trouble. That's just kinda how it is." What starts off as a simple retrieval of stolen goods turns deadly when Leena Espinoza discovers a girl stashed in a cellar, her guardian murdered. The crew has a soft spot for hard cases, and despite Delilah's odd behavior, offer help instead of turning her over to the authorities. But what they don't know might kill them. No good deed goes unpunished, and the crew winds up on the radar in the worst possible way. Merc squads, shadowy coalitions, plus the usual criminal element are all on their tails, so it's fight or flight. To ask other readers questions about Make Bright the Arrows, please sign up. 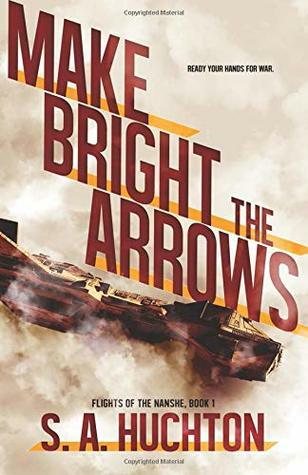 If Josh Wheden were given an opportunity to remake “Firefly” with an all-girl cast, he’d likely produce “Make Bright the Arrows (Flights of the Nanshe, Book 1)”. As it is, author Starla Huchton delivers an amazing homage to that classic SciFi series, and she narrates it herself terrifically, using multiple accents to great effect! My favorite of her voices is that of Cynthia, the pilot, but alas, despite there being identical twins on board the SS Nanshe, this book is not lesfic, is not erotica a If Josh Wheden were given an opportunity to remake “Firefly” with an all-girl cast, he’d likely produce “Make Bright the Arrows (Flights of the Nanshe, Book 1)”. As it is, author Starla Huchton delivers an amazing homage to that classic SciFi series, and she narrates it herself terrifically, using multiple accents to great effect! My favorite of her voices is that of Cynthia, the pilot, but alas, despite there being identical twins on board the SS Nanshe, this book is not lesfic, is not erotica and there is not even a romance. There is though, a hugely enjoyable story of smugglers with varied pasts, space battles, mysteriously shady organizations, and, as with all great SciFi stories…a human story of friendships and loyalties. The story is told from the POV of Leena, one of the crew of the SS Nanshe. As the first person to find 15yo Lilah, she is put in charge of her until they find a safe place for her. It’s cute how they bond over watching Leena’s pan-galactic rodeo crush, braiding hair, and talking of climbing trees! I really love it when an author tells a story of real people, not just dazzling high-tech adventures. Well, it turns out that the safest place for Leena is on the smuggler ship, and dazzling high-tech adventures do abound! inspiration in the determination of people to carve out a life, even in dangerous places. What we mean to other people doesn’t define us…but it does give us purpose. There is lots of action packed in “Make Bright the Arrows”, but I was glad we got to know the characters as well as enjoy the action. The audiobook deserves my 5* rating, and I encourage anyone who loves strong women characters in a SciFi setting to listen to the book! Interestingly, this is the first time I’ve seen an audiobook being released a few weeks ahead of the Kindle version, btw! The story wrapped up not quite as a cliffhanger, but certainly teases with further adventures for Lilah and all the others! I definitely look forward to the next book in the series! A routine, if unexpected, delivery of a package by the all female crew of the almost legitimate retrieval ship, the Nanshe, finds the named recipient dead and a young girl hiding in a cellar. She says she's fifteen but looks no older than twelve. And she is terrified. And talking in biblical phrases. Not knowing what else to do since she is obviously alone and had probably been abused, the crew take her on board and Lena, the most recent of the seven members, is tasked with caring for her until she can be delivered to a Convent community a few days travel distant. And then it all goes wrong. Fast paced, intriguing and well written, this first book of a new space adventure series is both exciting and, at times, amusing with good characterisation and dialogue. The women on board are very individualistic, far from perfect loners but with an intense loyalty of family to each other. They try to do what is right but in this futuristic world, that isn't always clear and rarely easy. A good series introduction, starting gently but rapidly building into cosmic action, it is also narrated by the author, S.A.Huckton, which can frequently be a big mistake, but in this case her performance definitely enhances the listening experience. Her reading is clear, well paced, with good intonation and adherence to the nuances of the text. Her character voicings are superb, very distinctive and different and with a variety of accents, increasing the feeling of really getting to know the crew. I very much look forward to book two with Ms.Huckton once again narrating. Huchton created a memorable crew for the mercenary ship, the S.S. Nanshe. The youngest and newest member of the crew is our protagonist, Leena, and she builds a relationship with a young, scared, extra special foundling named Delilah. The book really did have a Firefly(esque) feel to it, so much so that I found myself wanting to give them all brown coats (LOL)... But, I didn't care, really that just made me love it more! Wait. What? Was that a Man from U.N.C.L.E. reference? Hahaha... a Man from U.N.C.L.E. reference (seems kind of odd, from someone of her generation). Do yourself a favor and grab this action-packed Space Opera. Folks that like books by Becky Chambers, or enjoyed Firefly (the series) are gonna love this book. Heck people that found and loved Lindsay Buroker's The Emperor's Edge, with Starla Huchton's narration on podiobooks from way-back-in-the-day are gonna be thrilled to see what Starla's up to now! I had requested and received audible version of this book for free from the narrator / author, in exchange for an unbiased review. This book reminded me so much of Firefly that it made me nostalgic. It was very easy to get into this book. The female lead characters are sassy and strong. Their relationship with each other and interaction with the world around them is a pleasure to watch. The author has thrown them into a situation which leads to a fun advent Disclaimer. This book reminded me so much of Firefly that it made me nostalgic. It was very easy to get into this book. The female lead characters are sassy and strong. Their relationship with each other and interaction with the world around them is a pleasure to watch. The author has thrown them into a situation which leads to a fun adventure. It is fast paced and full of thrill and excitement. Hardly any dull moment. I enjoyed the journey immensely. Nothing specific that I can think of. Make Bright the Arrows for me was an exciting space western full of action, mystery and shadowy organizations. Some elements of the universe felt influenced by the show Firefly but they were flushed out and taken in a direction uniquely its own. The narration of the audiobook was performed by the author with outstanding results. I hope there are future books in the series to explore this interesting universe in more depth. 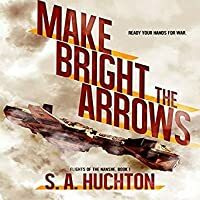 I was given this free review copy audiobook at my request and have volunta Make Bright the Arrows for me was an exciting space western full of action, mystery and shadowy organizations. Some elements of the universe felt influenced by the show Firefly but they were flushed out and taken in a direction uniquely its own. The narration of the audiobook was performed by the author with outstanding results. I hope there are future books in the series to explore this interesting universe in more depth. Very interesting sci-fi story, all female, but actually really cool! Love the southern accent haha! "Firefly," so that part's lost on me, but I enjoyed this audiobook very much and am anxiously awaiting more in the series! If you love strong female characters, you'll love this one! I was given this free review copy audiobook at my request and have voluntarily left t Very interesting sci-fi story, all female, but actually really cool! Love the southern accent haha! Amazing! S.A. Huchton is definitely one of my favorite authors, and if I had read nothing else by her, this book would have put her on that list! I Was lucky enough to get an advanced audio copy and must say that I loved it. Starla did a wonderful job with narration! The story was captivating and drew me in quickly. Huchton never disappoints, and this book was definitely up to what I've come to expect from her. The characters were fantastic, the plot had my imagination, and I cried at least once. Of course, I laughed far more than that. I gasped, I yelled... everything.